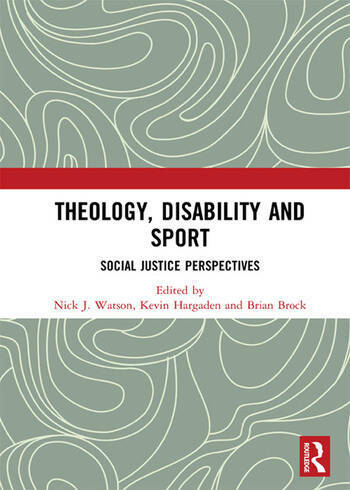 This ground-breaking book provides fascinating insights into the fast-emerging body of research that explores the relationship between sport, theology and disability within a social justice framework. In the shadow of two major sport-faith events that fore-fronted the theology of disability sport, the Vatican’s international conference—Sport at the Service of Humanity and the Inaugural Global Congress on Sports and Christianity York St John University, UK, at which Dr Brian Brock led a thematic strand on the topic—this book provides a foundation for further research and practice. This text is a timely and important synthesis of ideas that have emerged in two previously distinct areas of research: (i) ‘disability sport’ and (ii) the ‘theology of disability’. Examples of subjects addressed in this text include: elite physical disability sport—Paralympics; intellectual disability sport—Special Olympics; equestrian sport; church, sport and disability, and; theologies of embodiment, competition and mercy. This book, written by leaders in their respective fields, begins a critical conversation on these topics, and many others, for both researchers and practitioners. The chapters originally published in the Journal of Disability and Religion and Quest. Nick J. Watson is Associate Professor Sport and Social Justice at York St John University, UK. His research and practice is interdisciplinary and is accessible to a wide audience and broadly focuses on issues surrounding ‘social justice’ in sport, in particular, the relationship between sport and Christianity. Nick is also a Trustee of The Island, York, UK, a charity that provides mentoring services for vulnerable children. Kevin Hargaden is the Social Theologian for the Jesuit Centre for Faith and Justice, in Dublin, Ireland. In that role, he theologically reflects on social issues, with a particular focus on housing, penal reform, environmental care, and economic justice, with a view towards policy change in Ireland. He is the editor of the recent book, co-written by Brian Brock and Stanley Hauerwas, entitled Beginnings: Interrogating Hauerwas (2016). He is a guest editor of the Journal of Disability & Religion.